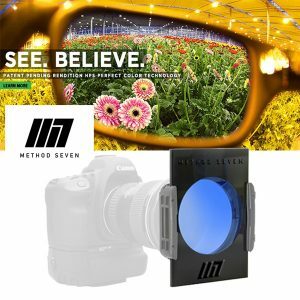 Method Seven technology blends incredible color balancing for each of the standard grow lighting spectrums (HPS, Metal Halide, LED, Sun) with exceptionally high quality lenses that provide the best in optical clarity. 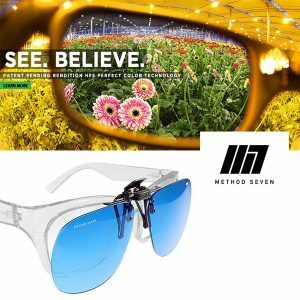 Additionally, Method Seven protection removes all harmful UV A/B rays like most others but additionally also removes harmful UVC rays which are filtered out of sunlight by the upper atmosphere, but pose a significant hazard under grow lighting. Color balancing is adjusting or filtering unbalanced or color shifted light from artificial sources to act like color balanced, normal “white” sunlight which allows human eyes to perceive all colors naturally. 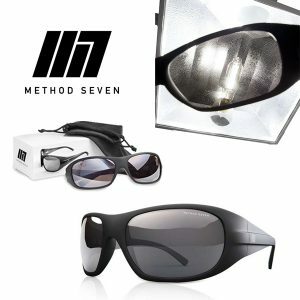 You can read more about Color Balancing from the link in our Optics & Spectrum Info section below. Lighting spectrum means the mix of colors of light within a lighting source. Sunlight is composed of the full, balanced spectrum across all the visible wavelengths of the rainbow – a magical distribution of reds, yellows, greens and blues. 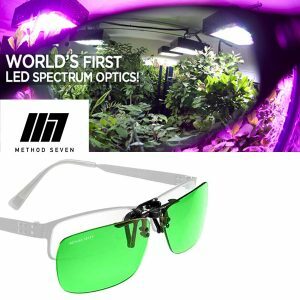 Each grow-room light source (HPS, MH, LED) has its unique spectrum – a VERY imbalanced distribution of light with a very high percentage of the light occurring in just a few wavelengths typical of the chemistry and physics of that light source. 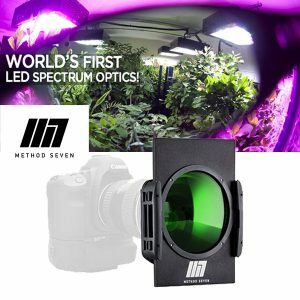 You can read more about Lighting Spectrums from the link in our Optics & Spectrum Info section below. 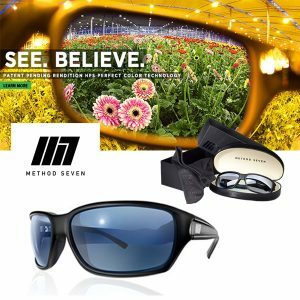 Optical Clarity is the state or quality of being clear or transparent to the eye, free from darkness, obscurity, or cloudiness, without discoloration, defect, or blemish. Optical Clarity is essential to comfortable and productive functioning of the eyes and brain. Only optical products produced to the highest standards provide outstanding clarity, and most cheap optical products have unacceptably low clarity for frequent use. You can read more about Optical Clarity from the link in our Optics & Spectrum Info section below. 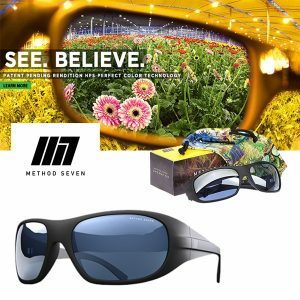 Many growers suffer through unnecessary stress, fatigue, decreased yield, and even permanent eye injury from using sunglasses or cheaper knock-off grow room glasses. 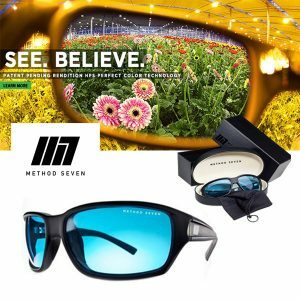 At best, even premium sunglasses attenuate (decrease) excess light in the grow room but do a horrible job of color balancing in indoor lighting environments, leading not only to discomfort and stress, but also to poor viewing and maintenance of your plants. 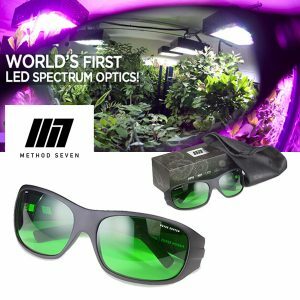 Cheap grow room glasses do an okay job of color balancing, but typically have very poor optical quality and inadequate protection from UVC rays. Each of the types of ultraviolet light (UVA/UVB/UVC) is very damaging to eyes. Grow room lighting produces considerable, dangerious UV light, including UVC which is not a significant threat from sunlight. Damage is cumulative over time, with results from mild to severe including formation of cataracts or macular degeneration of the corneas. 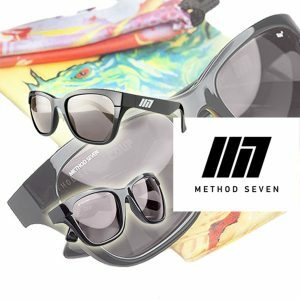 All Method Seven glasses provide 100% protection from UVA/UVB/UVC, while some others do not. 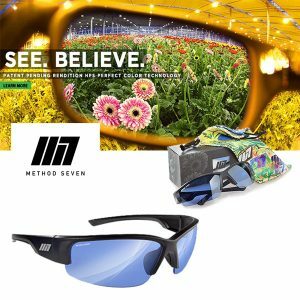 You can read more about eye safety from the “Eye Protection & safety standards” link in our Optics & Spectrum Info section below.